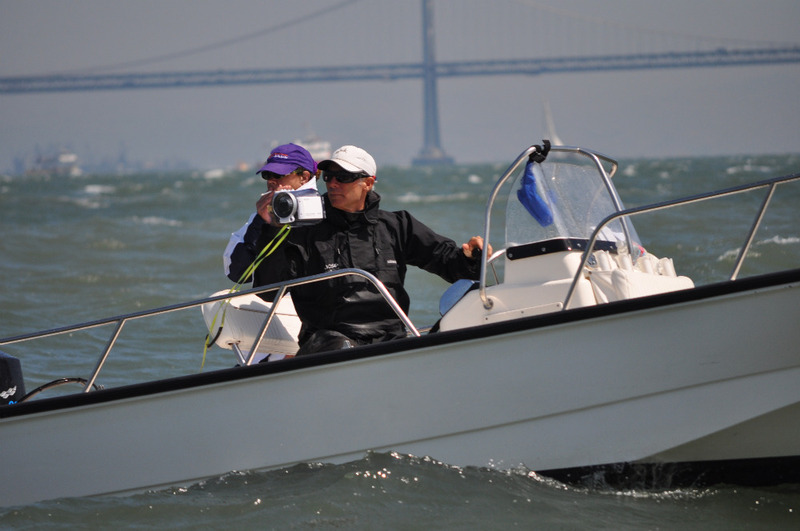 It’s not just a full circle, it’s a rich full circle to see John Bertrand on San Francisco Bay, returning as a coach to the waters where, as a youth, he separated himself from the pack and then went on to win back-to-back Laser world championships, the Finn Gold Cup and an Olympic silver medal. One day after his protégé, Luke Lawrence, won the Finn junior world championship—and looking toward the Finn Gold Cup racing that opened Monday on the Berkeley Circle—we sat down to talk about the art and science of coaching, his decision to return to the Laser in masters competition, what an Olympic class should be, and his love affair with a certain “torture rack” also known as a Finn class dinghy. Here is John Bertrand in coaching mode, with Gloria Lawrence (aka Luke’s mom) filming a start of the junior worlds . . .
I’m curious about your top picks for a 96-boat fleet in the 2010 Gold Cup, but first, what makes a winner in the Finn class today? What I’ve learned over the last year, in the Laser and Finn both, is that world championships are being won downwind. You cannot be slow off the breeze. The Berkeley Circle is a well-known track. For this regatta you’re anticipating big wind and big waves, and I don’t expect any surprises on where you need to go. You need to start well, and the top guys are going to pop out. Upwind, they’ll all be competitive, and then it opens up going downwind. I used to finesse my way downwind, but with the new unlimited-pumping rule [in winds above 12 knots], it’s all power-based. It’s about technique, and it’s about how strong you are, and how hard you can rock and how long you can keep it up. These guys are standing up downwind. They’ll heel the boat to windward and go by the lee, then stand on the leeward side and pump, then lean on the weather side again. You can’t physically pump the whole leg, so the guys who pump longer do better. I’ve never seen Ben Ainslie sail [the triple Olympic gold and silver medalist is not entered in the 2010 Gold Cup], but my understanding is that he can do that and not lose his technique. He must have taken it to the next level. So who are your picks for the Gold Cup? Ed Wright is a powerful sailor. He’s due. He came out here and won the North Americans, but there are a number of other players. Rafa [Rafael Trujillo of Madrid, Spain, ESP 100] is physically the biggest. He should be competitive. And Trujillo is the leader after day one . . .
Ivan from Croatia [Ivan Kljakovic Gaspic, CRO 524] is another. I’ve been impressed by how well he sails; he makes very few mistakes. And Zach Railey [USA 4] has it all. Upwind speed, power, and he’s very fast downwind. I’ve seen him pass tons of boats. I confess, honorable reader, yr humble servant neglected to ask about the defending Gold Cup champion from Denmark, Jonas Hoegh-Christense. Instead we moved on to – John, what was it like, as a back-to-back Laser world champion, to transfer to the Finn? The Finn is a very physical boat. It puts different stresses on the body. Once I got over that shock, it was in some ways easy because we were introducing Laser techniques to a class where they weren’t in use yet. The other John Bertrand, the Australian one, along with Peter Barrett and some other North Sails guys, got together with the Harken brothers and made the Vanguard Finn, which was a huge leap forward. It was so nice coming to a new thing, not saddled with a need to solve equipment issues. And it took a long time for the Europeans to catch on. They still had wood decks and the like. I don’t know if that was pride, or what, but it wasn’t until about 1984 that everybody switched over. For your masters sailing, you’ve chosen the Laser. The Laser is a more enjoyable boat. The Finn is hard work. It’s a job. The last time I actually set foot in a Finn was the final race of the 1984 Olympics. I viewed it as a kind of torture rack. It was in the Finn class that Paul Elvstrom introduced the concept of the sailor as athlete. Frankly, that’s the reason I got into the Finn. I’m not built for it, but I was able to wear water jackets and bring my weight up by 44 pounds. I could make the weight I needed. But I always assumed that the class builds mental toughness, and it’s tactically good. On technique and equipment you need to be really good, so it addressed all the things I wanted to accomplish. And the Finn has a macho caché, even more so now. I have no illusions that I could be competitive in a Finn today. A good friend of mine who’s won the masters worlds twice dropped out of the class when they disallowed weight jackets, and he’s bigger than I am. How does Olympic status affect the class? You could flip that and ask, What would the Olympics be without the Finn? To me, Olympic sailing is the Finn. It embodies everything Olympian. It’s our marathon, our triathlon. Olympic competition is about the effort that goes into it. The athleticism, the competitiveness, the nationalism. The Finn is even more fitting with the class so vital and thriving and the youth side growing. In your youth you had a powerful, longterm relationship with your coach, Bill Monte. How does that inform your work as a coach now? It’s huge. Everything I learned I’m trying to pass on. First and foremost it’s about trust, and what I try to impart—with Luke, with the Olympians [including Anna Tunnicliffe] that I coached for 2008, was confidence. The belief that you can succeed. The next step is to give them some ways to succeed; set them on a path. Coming full circle, Bill Monte mapped out my route; I just executed the plan. We would meet once a year for eight hours and map out the whole year to come. We’d determine which regattas I was going to, and there would be a different set of objectives for each. Sometimes it had to do with results. At other times it was not about results, it was about performance, getting good starts, nailing the tactics, something. Congratulations are in order, too. 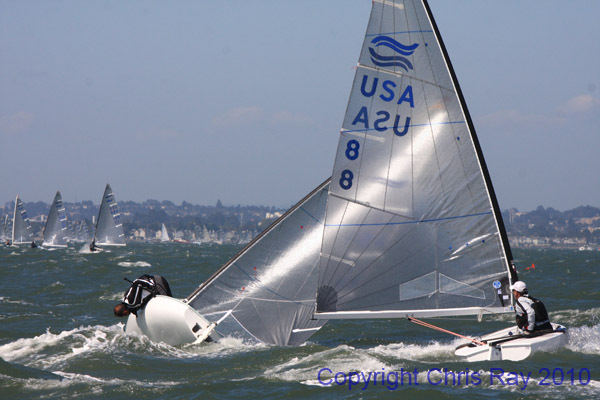 I figure you share some part of Luke Lawrence’s win in the Silver Cup, the junior Finn worlds. That’s one somebody who will never forget what he was doing on his twentieth birthday, as in placing third in the final race, which is exactly what he had to do to take the title. So what was involved in the next step, taking our no-longer-quite-a-teenager from the 15-boat junior fleet to the 96-boat 2010 Gold Cup fleet? Luke is actually very capable in large fleets, and a small fleet is sometimes harder. His goal was the Silver Cup, and he accomplished that. After that comes the meeting to set objectives for each race of the Gold Cup. We can always adjust if we need to, but it’s more about performance than scoring. We’re trying to build a foundation. You have to go through the whole alphabet before you can spell. I’m sure his mast/sail combination is not what it ought to be, but it’s good enough. [Hear a three-minute audio of Bertrand on coaching here] Luke has only been in the Finn since January, so at a technical level he still needs to learn how to sail the boat. It can be exciting to think about his potential, because he wasn’t the fastest out there in the Silver Cup. In September you’re off to the Laser masters worlds in the UK. What’s your mindset on that kind of competition? It can’t be the same as chasing an Olympic medal. I’m a little anxious about going to the worlds and not being where I want to be—I would have liked more practice, instead I’ve been coaching—but maybe that’s what masters sailing is all about. It’s a great scene. It was one of my fears, having been so competitive as a youth, with such high expectations, that getting back into the Laser I’d feel like a failure, but it’s not like that. I’m probably as fit as when I was younger, just not as flexible. Laser sailors today are more physical, and they’re faster. I’m kind of at the same level as when I was a youth, but the standard has moved up, in masters sailing too, so the challenge is still there. So you wouldn’t mind winning, but that’s not the reason to go. Correct. Otherwise I would have approached it a lot differently. Next year may be another story. 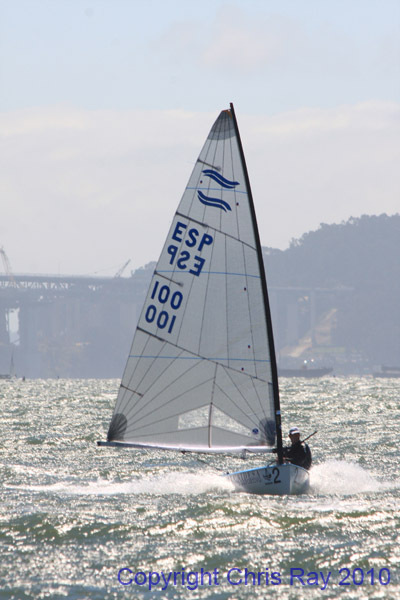 The St. Francis Yacht Club is running the 2010 Gold Cup for the Finn Class. Racing will be in the East Bay, with shoreside staging out of Marina Bay, Richmond, so that weary sailors are spared a five mile beat back to the St. Francis docks. The competition runs through Saturday. Feel the burn.